Tonsils situated at the back of the throat, are part of the lymphatic system. Main function of the tonsils is to produce antibodies that are capable of fighting infection. After the age of three the tonsils shrink and its role in the fight against infection decreases. But it is a sad fact that the tonsils themselves can get infected by bacteria and viruses. Infection of tonsils is referred by the medical term tonsillitis. Fever and throat pain are the common symptoms of tonsillitis. Group A streptococcus: Group A streptococcus is a common bacteria which causes throat infection. These bacteria may be present in many people without showing any symptoms. Illness like rheumatic fever is also caused by these bacteria. Respiratory Viruses: Most of the tonsillitis cases can be due to the presence viruses which cause flu and cold. Tonsils disorders caused by viral infections are rather milder than bacterial infections. Epstein-Barr virus: A viral illness named Infectious mononucleosis caused by Epstein-Barr viruses is also a major cause for tonsillitis. Sore throat is one of the main symptoms of tonsillitis. 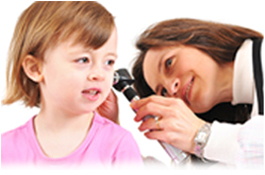 But since throat and ear are served by the same nerve, the pain is usually felt in the ear. Difficulty and pain during swallowing is another symptom of tonsillitis. Younger children may not be able to distinguish or express the pain, but they simply refuse to eat. Tonsillitis caused by bacteria and ordinary viruses are cured by taking medications for a few days. But if the tonsillitis was caused by mononucleosis it will take weeks to get relief. Infection of group A streptococcus bacteria can spread to other parts of the body including heart and can cause permanent damage to the heart. For children with recurring sinusitis family members will be tested to see whether they are asymptotic carriers of group A spretococcus. If family members are found to be carriers of group A spretococcus virus they will also be given antibiotics to ensure that the disease does not recur. For quinsy which is an inflammation in the throat with abscess, drainage of the fluid followed by antibiotics is the normal course of treatment. If the tonsils are large or if the tonsillitis is a recurring one, then surgical removal tonsils will be done by your surgeon. Tonsillectomy is the name of the procedure used for removing the tonsils. This procedure is usually done under general anesthesia and it takes about 30 minutes only to complete the procedure. After the surgery the patient will be taken to the recovery room where he will be under observation till he wakes up. Tonsillectomy is a safe surgery. There are no chances of complications or risks in this surgery. Bleeding is the only important risk factor in tonsillectomy. In some cases it becomes necessary to conduct a second operation for stopping the bleeding.